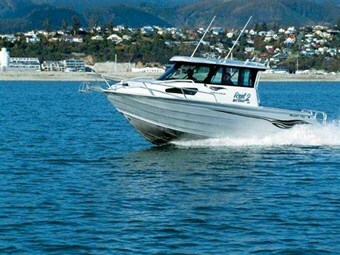 Nelson’s Totally Boating dealership says steadily increasing fuel costs have triggered a noticeable trend to diesel power in the larger trailerboat market. Two McLay hardtop cruisers are prime examples. Paul Smith reports. Mercury Marine’s successful relationship with Cummins has resulted in a variety of diesel engine options available with Mercruiser stern drive propulsion systems. Totally Boating has installed two of these into a pair of McLay Cruiser Hard Tops – a 745 and 775. McLay boats are constructed in marine grade alloy – bottom hull sections are formed in 6mm while the sides and transom are in 4mm treadplate alloy cockpit soles are also fully welded in 4mm, and keels are double reinforced along their entire length. Curved safety glass windscreen provides good visibility for’d, while glass sliding side windows provide ventilation. They’re complemented by windows in the rear wheelhouse bulkheads allowing clear views around the entire boat from the helm. Both the 745 and 775 have fully-enclosed hardtops and all cabin surfaces in both vessels are fully lined. The two vessels differed in specification relative to their intended uses. The 745 had been specified with an extended wheelhouse to better suit the owner’s desire for weekending capability. The additional room in the wheelhouse allowed the fitting of a two-burner stainless steel stove on top of a huge storage locker located directly aft of the helmseat to starboard. To port is a large refrigerator and the tops of both offer additional seating with removable upholstered squabs. It’s also fitted with a 100-litre water tank mounted beneath the wheelhouse sole just ahead of the 300-litre fuel tank. The slightly longer 775 is configured as a day boat with the standard length wheelhouse. This configuration provided a considerably longer cockpit despite the boat being fitted with a longer in-line, six-cylinder engine. Both boats on review were specified with the optional sports walk-through transom treatment to a caged boarding platform. They’re formed in treadplate alloy with strongly welded alloy railing and boarding ladder. 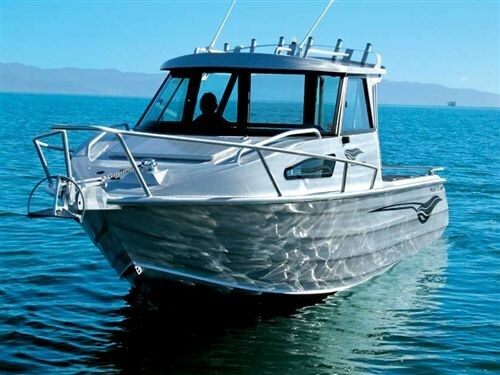 The hull design is the same for both boats – length differences aside – being a variable deadrise vee bottom with 18 degrees measured at the transom. The delta keel plate is flanked by two planing strakes either side, while the very wide chines (aft hull) taper going for’d and feature a sharp downturn along the entire chine length – giving a gull wing-like profile. Both boats offer the same layout treatment to the bow and forecabin areas and differ only in the wheelhouse configuration (and thus the cockpit size and layout). Bows are protected by a solidly-constructed alloy bowrail. A double fairlead – one for anchoring, the other mooring – is complemented by a Sarca #3 anchor actuated from the helm by a Maxwell Freedom 500 capstan on the 745 and a Muir Freefall on the 775. There are plenty of hand-holds on the cabin tops and wide walkways around the superstructure make getting for’d painless. Forecabins on both boats have been fully lined and the full length vee berth can convert to a double with use of the optional infill squab. There’s provision between the berths for a portapotty, and lined storage under and in the parcel trays that extend along the length of the cabin either side. 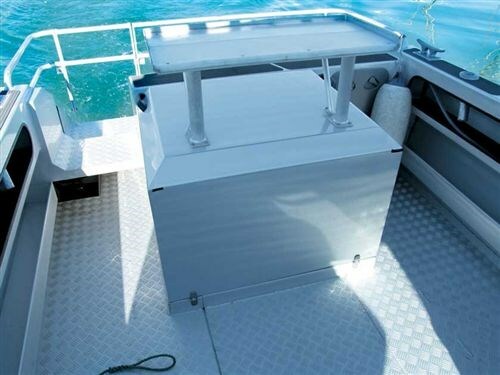 A large solid alloy hatch gives another easy route to the foredeck and provides ventilation. Natural light is courtesy of the side light windows. A SoPac hatch in the front bulkhead gives access to the anchor/rope locker and winch. The absence of full bulkheads between the forecabin and wheelhouse enhances the feeling of spaciousness and also allows for easy movement of people around the "house" areas of the boat. Each boat’s helmstation was well-appointed and laid out with an array of Mercury analogue gauges monitoring engine functions. They flank a Lowrance LCX 110c chartplotter/sounder (on the 745) and a Raymarine C120 chartplotter/sounder (radar capable) on the 775. Both boats had the optional 1 kW transducer upgrade fitted. The VHF and CD/Tuners were located in the optional overhead consuls on each boat. An impressive feature of both boats was the immense amount of storage available – under the helm and passenger seats, under the wheelhouse sole in the case of the 775, and under the seats against the rear wheelhouse bulkheads either side. The seating in the standard length wheelhouse on the 775 model could also be easily and quickly configured to offer bench seating for up to four across the cabin. Access to the cockpit of both boats is via lockable, alloy bi-fold doors. Cockpit area in the smaller 745 is still sufficient to allow up to four people to fish even though the alloy engine cover and the seating/stove/washbasin modules against the wheelhouse bulkheads occupy a fair amount of available footspace. There are two rod holders flush mounted into each coaming with two full length trays along either side. The walkthrough transom on the port side has a removable alloy door that locates into a holder on the starboard side when not in situ. This gives easy access to the caged boarding platform that is probably the preferred fishing possie. Batteries – one house, one engine and bridgeable – are located in transom lockers above the treadplate cockpit sole and secured by a SoPac hatch. Another SoPac hatch on the boarding platform side gives access to the rear of the engine and driveline. The longer cockpit on the 775 allows plenty of fishing and/or diving preparation room for six or more. An alloy bait station mounted on the engine box is a useful addition to the 775’s cockpit. Cockpit coamings have non-slip pads and three flush-mounted rod holders per side. The transom walk-through on this boat is located on the starboard side – owner’s preference – and the platform/cage is also slightly larger than that on the 745. Both boats have rocket launcher rod holders on the wheelhouse roof. That on the 745 utilises twin three-rod holders, each mounted for’d/aft on either side at the rear of the roof. This allows a tender to mounted roof mounted when the need arises. The 775 has a six rod holder mounted across the wheelhouse roof as usual. Both boats are fitted with Mercruiser Bravo 2 stern drives and Cummins/Mercury diesel engines. The 745 has a 2.8-litre, in-line, four-cylinder engine (rated at 170hp) and uses "D-tronic" electronic controls. Turbocharged and intercooled, it drives a 21" alloy propeller. The 775 has a 4.2-litre in-line, six-cylinder engine (also turbocharged and intercooled) and rated at 230hp. It drives a 19" pitch alloy propeller. The four-cylinder engine does not run as smoothly as its six-cylinder sibling, but it occupies less space in the cockpit and is a little lighter. Although we were unable to verify fuel consumption, the smaller engine is likely to be a little more frugal. Installation of both power plants is neat and sanitary and the fully sound-insulated engine covers hinge back to provide good access for maintenance and servicing tasks. While the perfect autumn weather experienced when we put the boats on the water was ideal for measuring the boat speeds at engine speed increments, the glass flat water conditions gave no indication at all as to how these hulls handle sloppy and rough sea conditions so no further comment in this regard is offered. Each of the boats was lightly loaded with two persons and half fuel, although the 745’s 100-litre water tank was nearly full. Despite the slightly shorter length of the 745, its ‘weekender’ configuration probably makes it a little heavier than the 775. Both boats made the transition to plane easily although some minor turbo lag could be detected. The Cummins engines felt relaxed at engine speeds of 3000rpm and more and 200rpm increments from this speed to wide open throttle resulted in a satisfying increase in boat speed. Both power plants appeared well matched to their stern drive systems with maximum engine speed on the 170hp four-cylinder recorded at 3800rpm while the larger six-cylinder engine revved happily to 3900rpm flat out. Both Cruisers are ruggedly constructed, well finished and highly specified examples. 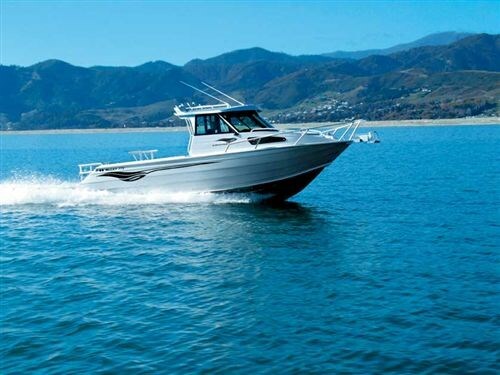 The Cummins/Mercruiser diesel stern drive propulsion systems provide adequate performance levels with superior range and economy in comparison with petrol fuelled engines. Each boat was supplied on a galvanized steel framed, multi-roller, tandem-axled trailer with four-wheel disc braking. Packages for the 775 from Totally Boating start at $122,400 and the "as reviewed" price is $144,500 inc GST. The 745 "as reviewed" has a sticker price of $139,000 inc. GST. Such pricing represents pretty good value for money and given that there is almost a year long waiting list for such boats from the McLay factory, there are plenty of boaties who agree.